FACT CHECK: Did North Korea Test Missiles Every 24 Days Under Obama? Sean Spicer, former White House press secretary for President Donald Trump, said in a Fox News segment Feb. 27 that North Korea tested a missile every 24 days under President Barack Obama. “Let me just draw the contrast. During the Obama years, every 24 days on average we saw a missile to get tested, fired from North Korea. Since President Trump’s taken office, it’s been 457-plus days,” Spicer said. Depending on the database, the regime tested either 74 or 85 missiles from 2009 through 2016, corresponding to one missile test an average of every 39 or 34 days under Obama. There were no known tests in 2010 or 2011. No missile tests have been recorded in over 457 days under Trump, although the databases report that the regime did test either 20 or 24 missiles during Trump’s first year in office – an average of about one missile tested every 18 or 15 days. Spicer, a senior advisor for the pro-Trump super PAC America First Action, compared the frequency of North Korean missile tests under Trump and Obama as evidence that Trump is making progress on North Korean diplomacy. “This president is getting results for the American people, for the peninsula, for the region and for our world,” he said. Trump and North Korean leader Kim Jong Un failed to reach a nuclear disarmament deal at the second summit between the two leaders last week in Vietnam. It is unclear where Spicer got his figures. He did not respond to requests for comment. The Center for Strategic and International Studies (CSIS) and the James Martin Center for Nonproliferation Studies at the Middlebury Institute of International Studies at Monterey (MIIS) keep databases of North Korean missile tests that show Spicer overstated the frequency of missile tests under Obama. CSIS counts 85 missile tests from Jan. 20, 2009 to Jan. 20, 2017, which averages out to about one launch every 34 days. MIIS recorded 74 missile tests over the same period – about one missile tested every 39 days on average. The CSIS and MIIS tallies vary in part due to differences in methodology. MIIS does not count missiles under a 300 kilometer range, for instance, while CSIS did. There were no missile tests in 2010 or 2011. Previous North Korean leader Kim Jong Il died in December 2011, and the regime saw a gradual build up in tests after his son Kim Jong Un assumed power. “I would argue that Kim Jong Un assuming power had more of an impact than Obama did in changing North Korea’s missile testing behavior we saw between Obama’s first and second term,” Cotton said. 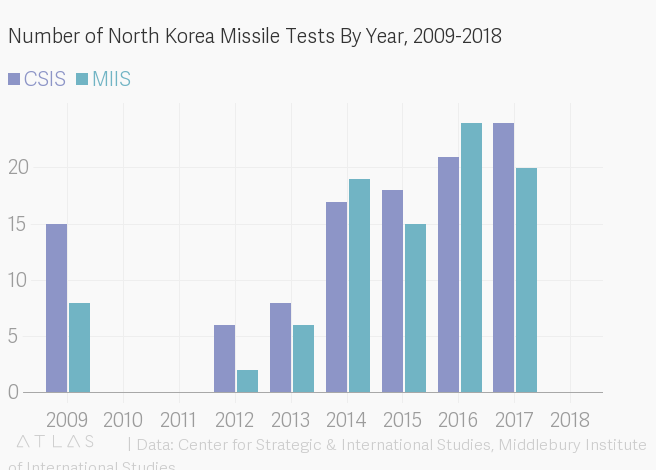 North Korea often tested multiple missiles on the same day – there were 41 days where North Korea tested missiles from 2009 through 2016, according to MIIS, which corresponds to an average of one set of missile tests every 71 days under Obama. Ian Williams, a fellow and deputy director of the missile defense project at CSIS, thought that the best measure of North Korean missile tests is the raw number of North Korean launches, whether successful or unsuccessful. “They learn a lot from failure, and Pyongyang’s persistence in the face of failure shows that they are committed to building a real, no-kidding strike capability, not just a propaganda effort or bargaining chip,” he told TheDCNF in an email. Spicer may have been thinking of tests launched only in certain years under Obama. A meme posted on Facebook pages “President Donald Trump Fan Club” and “Donald Trump Is My President” Feb. 28 made a similar, more specific claim. The meme understates the frequency of North Korean missile tests when considering all launches. CSIS counts 21 missiles tested in 2016, which averages to one missile tested every 17 days. MIIS counts 24 missiles tested in 2016, an average of one every 15 days. When considering the number of test dates rather than the number of missile tests, the meme’s claim is closer. MIIS reported 16 test dates in 2016, or one test every 23 days on average. The “President Trump Fan Club” and “Donald Trump Is My President” pages, as well as the website I Love My Freedom, which was cited in the meme, did not respond to inquiries about the source of the figure. Spicer and the meme correctly noted that North Korea has not tested a missile in over 457 days. The regime’s last reported missile test was on Nov. 29, 2017 North Korean local time – still Nov. 28, 2017 in the U.S. The regime did, however, test many missiles in 2017. “During Trump’s first year in office North Korea didn’t exactly dial it back either with missile testing,” Cotton said. MIIS counted 20 missiles tested in 2017, an average of about one every 18 days, while CSIS lists 24 missile tests in 2017, for an average of one every 15 days. Williams echoed similar skepticism about the impact that Trump has had on North Korean missile testing frequency. “[There are] a lot factors that go into when North Korea test fires missiles, and U.S. foreign policy is only one part of that,” he said.